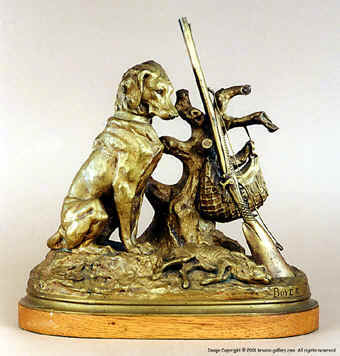 This is a very detailed sculpture of a proud hunting dog guarding his master's game bag, gun, and hare. Boyer is best known as a founder, he is known to have cast bronzes for Paul Gayrard as well as other 19th century sculptors and actual sculptures by this artist are extremely rare. This bronze is bolted on to a 3/4" thick contemporary wood base.